1) Matching large scale mirrored features from head to body around virtually the whole circumference of the nucleus. Early observations showing the distinctive bi lobed shape were publicly shared allowing scientists and interested citizens alike to proffer explanations. 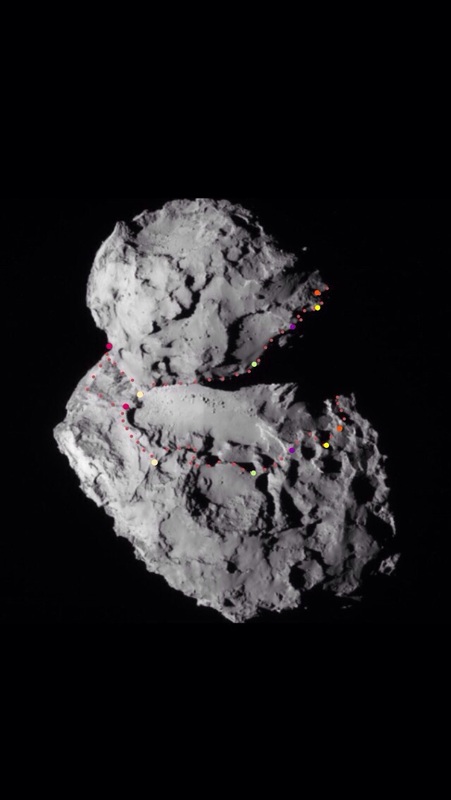 New Nav-Cam images were regularly published on the Rosetta Blog, which allowed further ways to test these explanations. 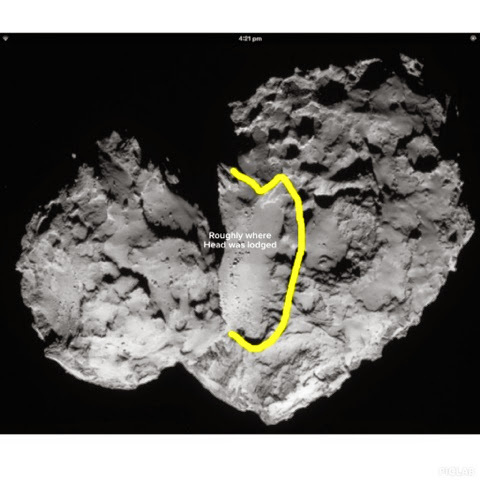 Stretch came to mind and the following annotated Navcam image shows a large scale rough match warranting further investigation. (click) An early approximation of where head would be lodged. Andrew Cooper took on the task quite early to verify the authenticity of these large scale matches through intensive 3D visualisation techniques. The recent availability of publicly accessible 3D models has enabled the manufacturing of 3D printed scale models and by taking a photo at the chosen angle to see the large scale match, it is quite obvious that it warrants the stretch hypothesis to be pursued through further analysis as has been done by ourselves. In this chapter, I will link to images showing that the matches go all the way around the circumference of the head matching to a jagged 3 D line on the body under the neck. 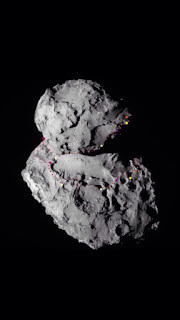 All Navcam images annotated by A. Cooper. Utterly obvious the head was attached in this image! Also the reader should click on " South Pole Matches ". This image is even more extremely telling, since the SHADOW of the head falls neatly just inside of the actual fracture line around the body. The shapes and textures really match up. I should have said "actual shear line", where the head split from the body... Not, "fracture line". Thanks.